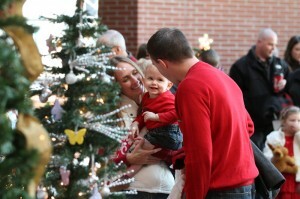 We were blessed to have been able participate in Akron Children’s Holiday Tree Festival preview party on Nov. 16. In fact, we were so excited that we didn’t think to get a little boy sitter for the evening. Fortunately the event was so intriguing to our little mister that it wasn’t a problem for his entertainment.